5793 labyrinths found. Showing 3761-3780. Sorted by country, state, city, then zip/postal code. 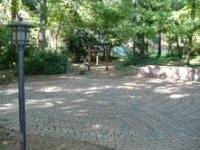 The red-brick labyrinth and peace garden makes a great spot for walking meditation and quiet reflection. 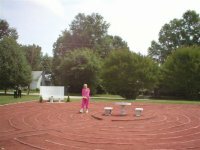 Located in Hobart Park (across Faculty Drive behind the athletic scoreboard), the labyrinth is lit at night and accessible at any time. Labyrinth is kept folded in office. 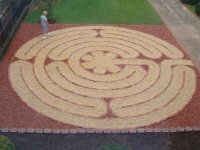 Rectangular labyrinth based on the Chartres style labyrinth design. Please email or call for directions. 6-circuit Abingdon labyrinth, adapted from a medieval manuscript labyrinth. Happy to have labyrinth walkers anytime; would like to put my dog in the house so he doesn't disturb your peace. From Highway 14 in Eden, take Aiken Road, going west. Turn left on Washburn Avenue. We are a few houses down on the right. You can't miss us - a church sign is at the intersection of Aiken Road and Washburn Avenue. 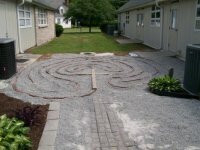 Labyrinth is located in the church's prayer garden, and is accessible to the public at all times. It is located on the northeastern side, between the two educational wings. Open year-round during daylight hours without appointment. Call for availability, but walks are scheduled on the first Thursday evening of each month: 7 to 9 pm. 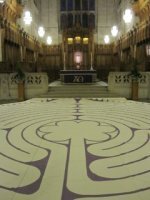 "Stations of the Cross" service on the Labyrinth on Good Friday at 7 pm. 747 Mill Creek Church Rd. MCCC is near the Bentonville Battlefield. 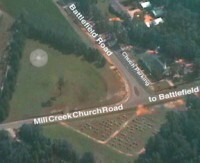 From Newton Grove or Smithfield take 701 and follow the Battlefield signs --MCCC signs are around the area. 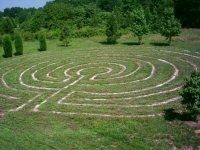 The Labyrinth is on the grass across from the parking lot and road, opposite the cemetery. Sometimes the area is called "Harper" on maps. Four Oaks is misleading as an address since it is a large region and better known as a town near I95. We are also known as "Bentonville". Just find the battlefield. 1201 S. New Hope Rd. made out of brick/pavers and located near the Ecclesia Garden, up the hill to the west from the church building. We are located at the end of Collie Rd., where the road turns to gravel, Sacred Grove Retreat is on the left - cabin for rent, event venue. 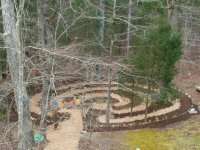 The labyrinth is beyond the butterfly garden and the yurt. 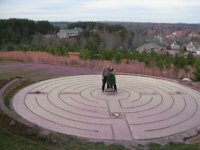 The labyrinth is open during the daylight hours. Please call beforehand. Call above number for appointment. Go east on Highway 40 from Asheville,NC (about 1.5 hours) Take Interstate 321 toward Lenoir. Go about five miles, over Lake Hickory bridge to Wal Mart shopping center. Turn right there. Go to the end and make a left. At entrance to River Bend make a right. Go to the top of the hill and turn left on Gun Powder Drive. Make first right on Black Hawk Drive and go to the top of the hill. Make a left on River Bend Drive and we are the house on the left: 753 River Bend. call for appointment - would love to have visitors.